WELCOME TO THE WORLD BABY FINN! I’m so excited to FINALLY share our baby boy Finley James’s nursery with you. 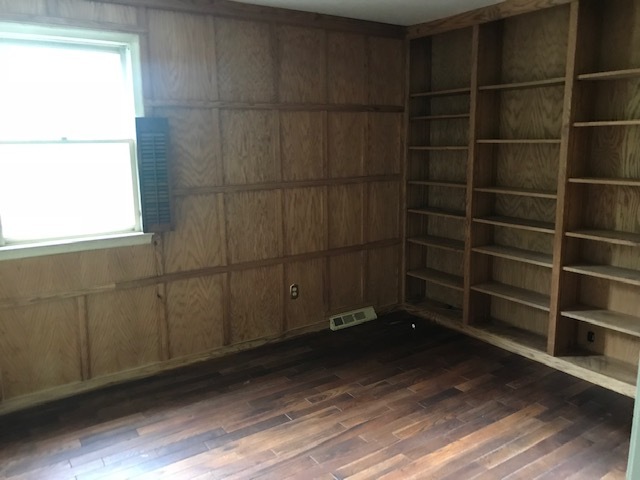 If you’ve been following our stories on Instagram for the last year or so, you’re semi-familiar with Our Fixer Upper.I’ll go out on a limb here and say this space (before) was one of the “worst” rooms in the house. 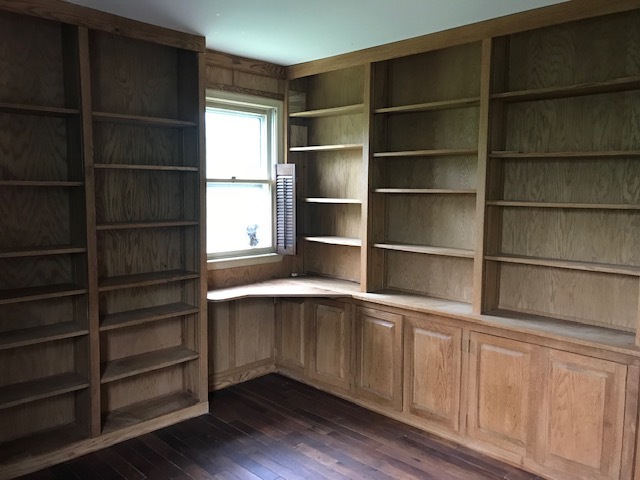 We had our work cut out for us not only fixing it up, but also making it a functional space for a bedroom. First thing was first, we needed to get rid of one of the walls of bookcases. Not only was it unnecessary, but because we needed the wall to create a proper space for a bed, or in this case a crib. Next, there was a huge botch/patch job in the ceiling that needed fixing. 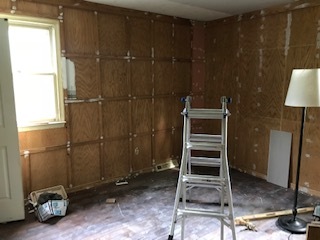 Because of its size and where the studs were placed, we ended up having to remove and replace about 40% of the ceiling’s drywall. Drywalling in general is not for the faint of heart, but drywalling on a ceiling… woof. While we were at it, we decided to add in a ceiling light. This took some trial and error as this was our very first time adding a light fixture to an existing switch. For some reason Our Fixer Upperhas very little ( to no) ceiling lights. I don’t know if it was an era thing, but it’s not our thing. So up she went! Once all of the structural and electrical work was done, it was time to pick the “perfect” light gray. 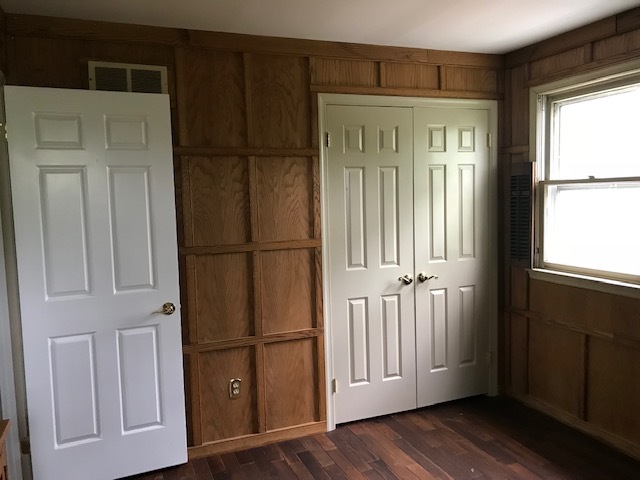 I knew I wanted to go with a warm gray, but could not have predicted how challenging it would be to find the right paint color for this room. At one point we had nearly 10 swatches painted on the wall. Weather it was too green, or too purple, too dark or too light, I was burning through all of my “go to “ grays. So what was a girl to do? Get creative that’s what. I started mixing some of the samples I had 50/50 to see if that would remedy the too dark too light problem, and it did the trick! Our final color mix for the space ended up being 50/50 Benjamin Moore Barren Plainwith its color swatch counterpart Benjamin Moore Calm. Because every inch of every wall was covered with wood, we used an oil based paint primer first. PRO – TIP – We ended up using our Paint Sprayer to paint this space. 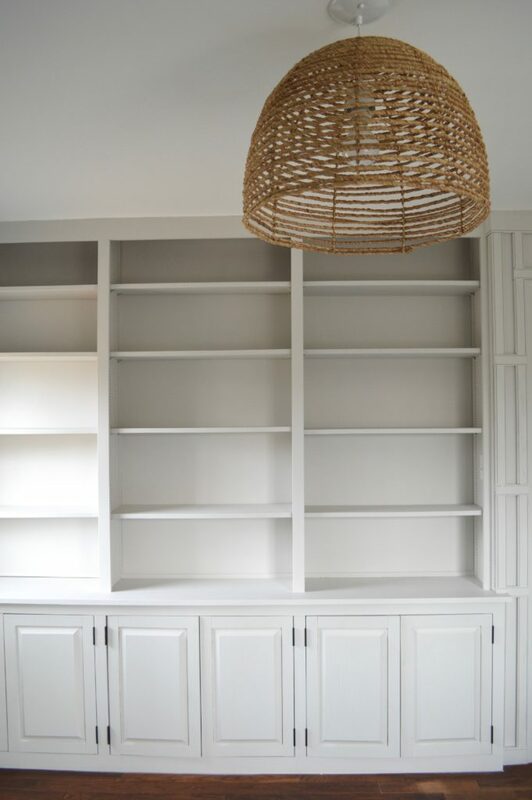 We mostly made this decision because of all the trim work and custom cabinetry, and let me tell you it not only saved time, it saved us a TON of paint! It literally cut the cost of paint in half. We we’re so surprised. So if you’re wondering if using a sprayer for your next project is worth it, the answer is heck yes! My inspiration for Finn’s room design came straight out of the Serena & Lily Catalog, literally. There was an outdoor furniture set all styled to perfection and in the background was the exterior of a building with the word “ beach” stenciled on it, that was all the inspiration I needed! 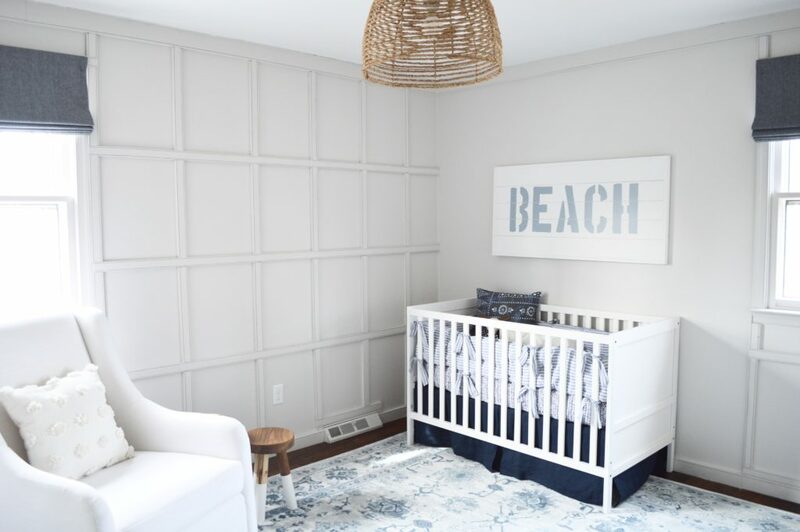 As it always does, one thing led to another and before I knew it I had pulled together a mix of beautiful blue hues, textures, and patterns perfect for a slightly sophisticated yet fun beachy oasis for little man’s nursery. When approaching any design for any space the décor and furnishings need to be a few things, functional, affordable, and achievable. 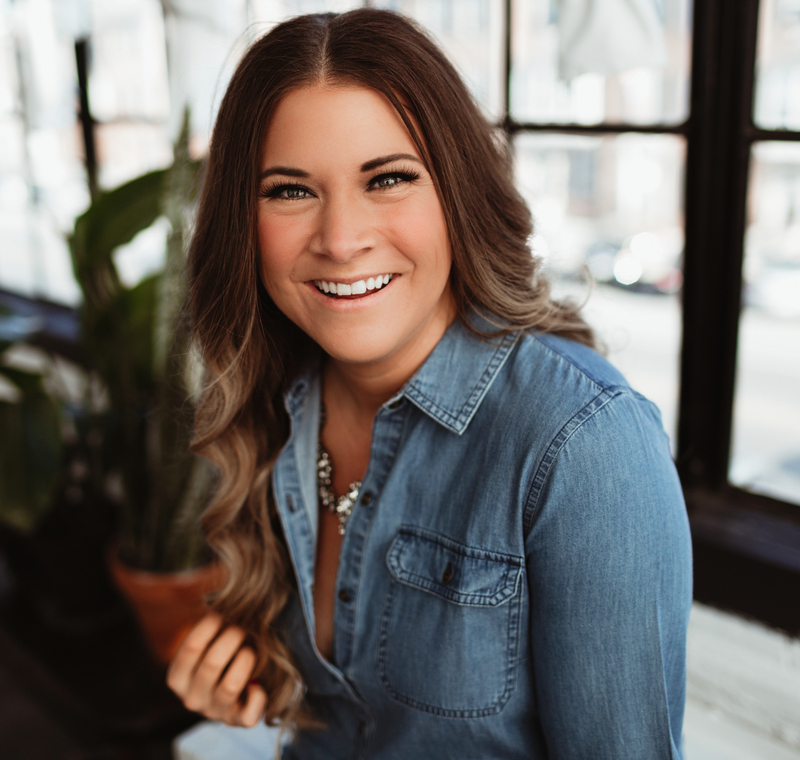 (For more on this see my previous post here) By following these three guidelines I was able to assess what weneededfor the space, what we would likefor the space, and other décor that could be added along the way. As you can see, Finn’s space isn’t entirely complete. 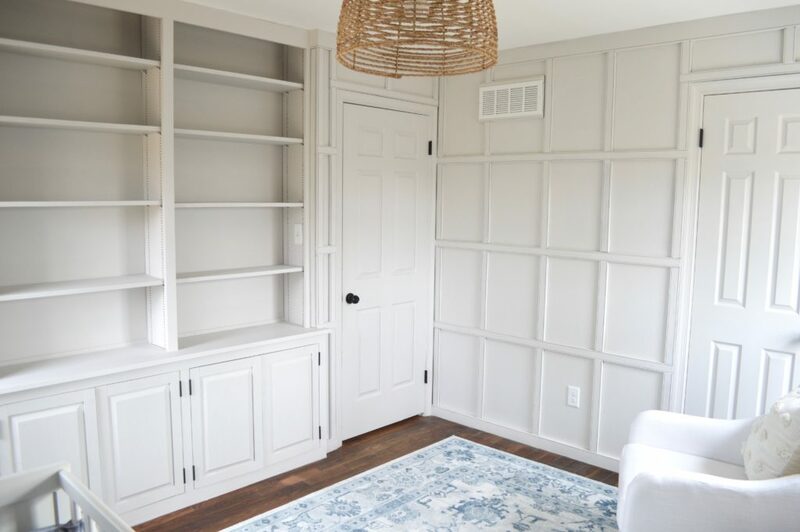 I still have a ton of styling to do with his beautiful bookcase/build in wall, but really consider this phase 2 because styling a bookcase is an entire project on its own! 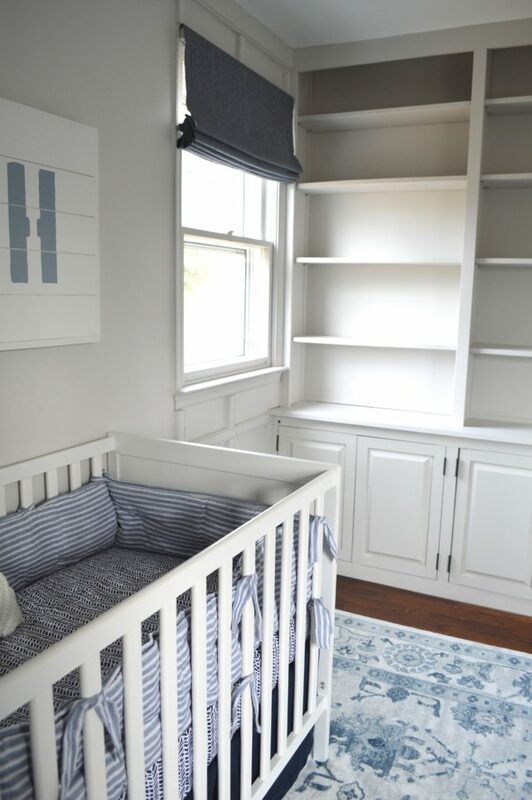 CRIB – This super affordable crib we’ve used for all three of our boys. It’s basic, durable, and again super affordable. It also now comes in a variety of colors to choose from. 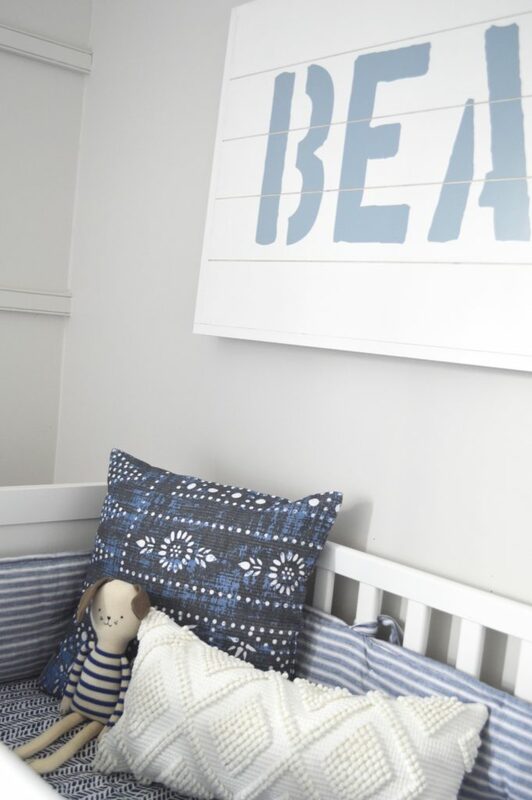 BEDDING – Finding the perfect textiles for Finn’s bedding was important, not only to establish a color palette, but also because it’s one of the most used elements in the space. It ended up being one of our “splurges” but was something I could justify based on the longevity of use we would get out of it, and because we saved big on the crib itself. We ended up ordering a bumper,crib sheet, crib skirt, and matching changing pad cover. RUG – The rugwe choose is by far one of my favorite pieces in our house. It’s not only beautiful, but it’s also such amazing quality, and so comfy. The best part is, it’s priced VERY well. We ended up ordering an 8×10’ to fill the space. We did this not only to warm it up a bit, but to bring some balance to an otherwise odd footprint. 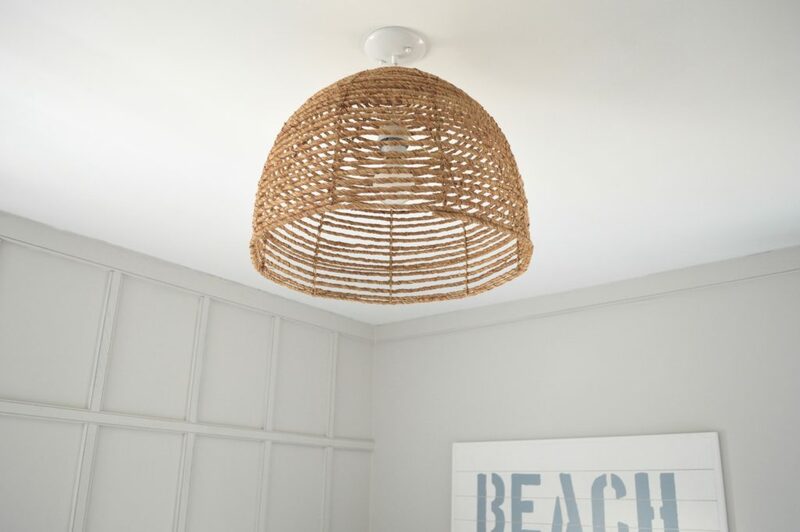 CEILING PENDANT– I love, and I mean LOVE the ceiling pendantwe went with. It’s such a beautiful statement piece. I did my due-diligence to see if I could find something similar for less, but honestly nothing compared so I waited for a sale and snatched it up! ROCKER– I never had a rocker in the Twin’s nursery so I knew I wanted one this time around. We were able to snag this beauty at our local Pottery Barn Outlet last Black Friday on super duper sale, we’re talking $225 which is insane. Regularly priced it’s definitely a splurge, but we were lucky to find it for a serious steal. 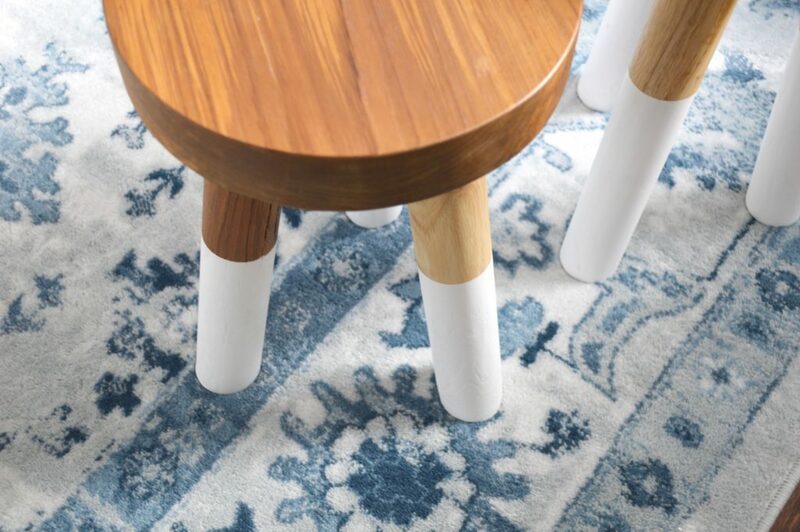 STOOLS– You’ve probably seen these cuties around, and for good reason. They’re seriously cute AND functional. I find myself moving them from room to room for different uses. To some they may not be a splurge, but for me they were. So I waited until they went on sale and then snagged them. We use them in this space layered together as little “side Tables”. ROMAN SHADES– This was a fun DIY project my Mom and I collaborated on. I choose roman shades because they were a more functional fit for this small space. I found these beautiful linen chambray looking shades and loved them, but wanted to get the look for less. 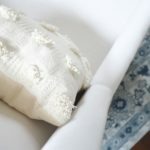 There are actually a ton of great DIY Roman Shade tutorials on Pinterest that I recommend checking out, but ultimately we choose to go with a pattern we found online which did require some sewing. Overall it was super simple, and could definitely be recreated san-sewing machine. The fabric I ordered from Etsy in the length needed for the two windows in the space. BEACH SIGN – Going back to the original inspiration for this room’s design, I knew I wanted to re-create that “Beach” stencil on a sign. This was a custom sign we made with a shiplap effect and is 24×48”, the perfect size for above a crib. 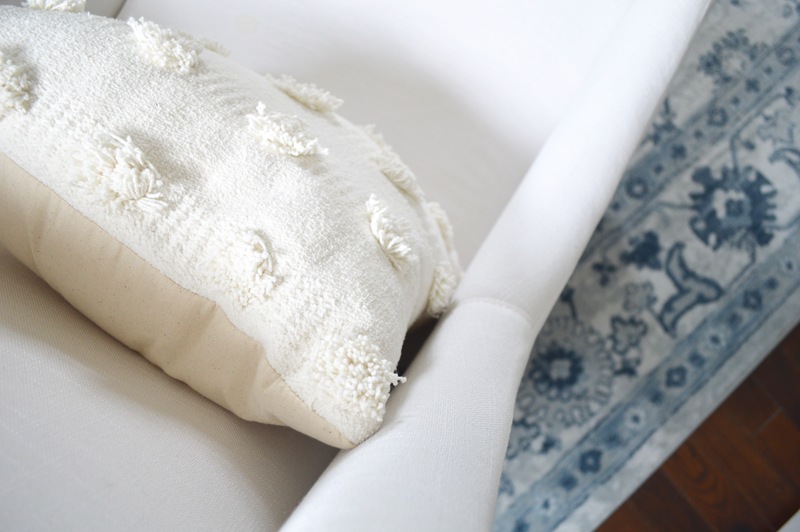 STUFFY+ PILLOWS– I found this sweet dog lovie and knew he needed to live in this space. The pillows are a mix of old and new from Target, and McGee & Co. I wanted to make sure again they stuck within the color palette and added the right amount of interest and texture. HAMPER– I have had my eye on this crazy cute and complementary hamper, but in all honesty it’s a bit of a splurge. So I’m holding out to find something similar and a bit more budget friendly at Homegoods, naturally. 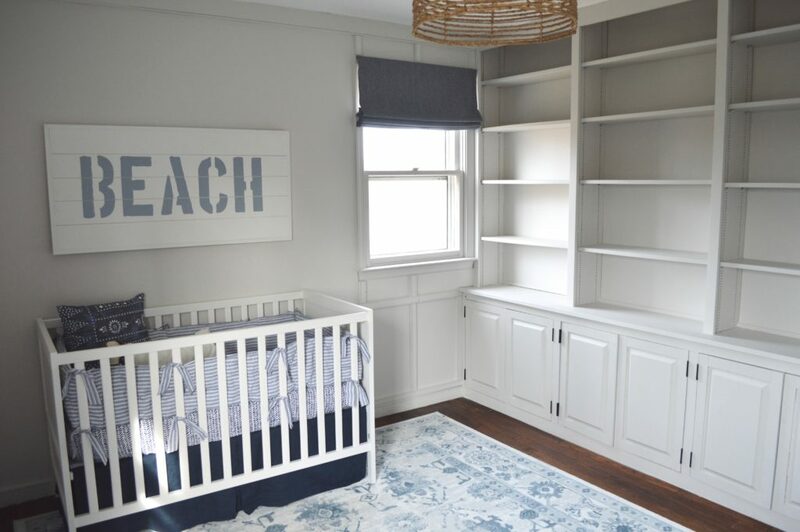 STORAGE BINS+ BASKETS– Because of the size of this space we had to get super creative with his closet, using shelving and baskets to hold all of his baby cloths and things. As he gets older we’ll just need to adjust the closet’s organization accordingly. But for now it works great as a pseudo changing station, dresser, and closet all in one! LAMP– I’ve had my eye on this lamp for some time. It has great reviews and would fit in perfectly. I hope you enjoyed this reveal! Feel free to leave comments or questions below. 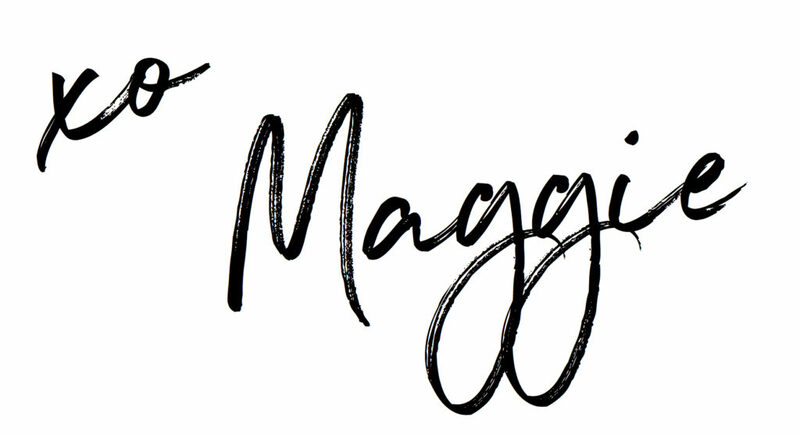 Subscribe to our newsletter to stay in the loop on new posts, sales, and products!